Bloomberg writer Jeff Wilson reported yesterday that, “The 8-foot (2.4-meter) corn stalks on Bill Long’s farm in southern Illinois are so big, green and healthy that he wishes he’d sold more of it sooner. “Like many growers across the Midwest, Long expects a second straight record crop that will boost domestic stockpiles already at a four-year high. Output in the U.S. will jump 2.8 percent to 14.314 billion bushels, the most ever, researcher The Linn Group Inc. estimated in a July 1 report. Even after fewer acres were planted, the wettest June on record left fields in the best condition since 2003 and sent prices into a bear market two months before the harvest starts. “Futures have tumbled 20 percent since the end of April, slipping into a bear market on July 3 to $4.1525 on the Chicago Board of Trade, after touching $4.145, the lowest since Jan. 10. The Bloomberg Commodity Index of 22 raw materials dropped 2.6 percent over the same period, while the MSCI World Index of equities advanced 4.5 percent. The Bloomberg Treasure index gained 0.3 percent. Meanwhile, Ben Leubsdorf and Jon Hilsenrath reported in today’s Wall Street Journal that, “The consumer price of ground beef in May rose 10.4% from a year earlier while pork chop prices climbed 12.7%. The price of fresh fruit rose 7.3% and oranges 17.1%. But prices for cereals and bakery products were up just 0.1% and vegetable prices inched up only 0.5% [related graph]. “The U.S. Department of Agriculture predicts overall food prices will increase 2.5% to 3.5% this year after rising 1.4% in 2013, as measured by the Labor Department’s consumer-price index. The Journal article noted that, “‘Your center aisles, more of the nonperishable goods, are seeing below-average inflation because commodities and the factors that go into producing them haven’t been increasing the same way,’ USDA economist Annemarie Kuhns said. 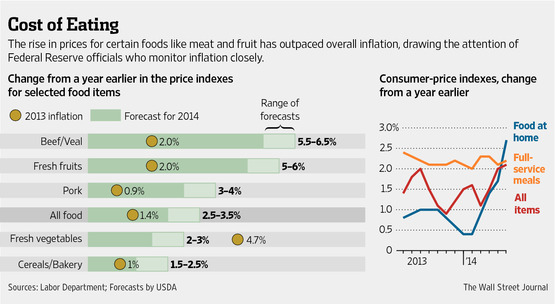 “The uneven rise points to disparate forces affecting food prices. Drought in Oklahoma and Texas is driving up cattle prices. A disease known as porcine epidemic diarrhea virus has killed millions of piglets and contributed to higher hog prices. A disease known as citrus greening is killing Florida’s orange and grapefruit trees, driving up citrus prices. Most of the shrimp eaten in the U.S. comes from Southeast Asia, where a bacterial infection has devastated stocks. Coffee prices have risen this year due to a drought in Brazil. Today’s article explained that, “If food-price inflation were spreading more broadly, it might first show up at restaurants, but so far that isn’t happening. The cost of eating at full-service restaurants was 2.2% higher in May than a year earlier, in line with its trend of the past year, according to Labor Department statistics. Grocery costs, by contrast, were up 2.7% in June, accelerating from increases of less than 1% for much of 2013. In other news, Leslie Josephs reported yesterday at The Wall Street Journal Online that, “Cotton is back in fashion among U.S. farmers, a trend that has pushed prices to the lowest level in more than a year and a half. Also, with respect the drought in California, Diana Marcum reported on the front page of Friday’s Los Angeles Times that, “For the first time in the more than half a century that the federal government had been diverting Sierra Nevada water to farmers, there would be no deliveries to most Central Valley irrigation districts. In the third year of drought, there wasn’t enough water to go around. In more specific news regarding livestock issues, Stephanie Strom reported in Saturday’s New York Times that, “A deadly virus, porcine epidemic diarrhea, or PEDv, is estimated to have killed, on average, more than 100,000 piglets and young hogs each week since it first showed up in Iowa in May 2013, wreaking havoc on the pork industry. “The number of hogs slaughtered this year is down 4.2 percent, according to the United States Agriculture Department, to roughly 50 million from more than 52 million in the same period in 2013. “Agriculture Secretary Tom Vilsack recently pledged $26.2 million for a variety of efforts to fight the virus, including development of a vaccine. The largest amount, $11.1 million, is to be allocated to helping hog producers with infected herds enhance their biosecurity practices,” the article said. Bloomberg writer Aya Takada reported late last week that, “Japan burns or buries 3.3 million metric tons of commercial food waste every year. Then it imports 10 million tons of corn to feed animals, more than any other country. “Asako Nagano and her colleagues at the agriculture ministry in Tokyo are part of a drive to recycle more food waste into fodder to help farmers cut costs as they prepare for increasing competition from overseas, she said in an interview yesterday. The Bloomberg article added that, “Of more than 6 million tons of waste from food makers, distributors and restaurants each year, about 2 million tons is turned into animal feed and 640,000 tons is converted to fertilizer, said Nagano. The remainder, which can be anything from bread crumbs to residue from brewing alcohol, costs companies on average 12,000 yen ($120) a ton to dispose of through the garbage system, according to ministry estimates. In addition, Eric Pfanner and Kana Inagaki reported yesterday at The Wall Street Journal Online that, “Haruyasu Miyabe used to oversee a computer-chip production line at a Fujitsu Ltd. plant here. One day last year, the plant manager told Mr. Miyabe to prepare for a career change. In trade related developments, Reuters news reported on Thursday that, “Germany’s Angela Merkel made a strong plea on Thursday for the European Union and the United States to complete their talks about forming a new transatlantic free trade area. The article added that, “Supporters say creating the world’s largest free-trade pact, and a marketplace of 815 million people, could boost the EU and U.S. economies by $100 billion a year each. Recall that on Friday, FarmPolicy.com noted that the House Majority Leader’s Weekly Schedule for July 7 does not include a reference to the Agriculture Appropriations measure. However, two House Agriculture Subcommittees will hold hearings this week: The House Agriculture Subcommittee on Horticulture, Research, Biotechnology, and Foreign Agriculture will hold a hearing on Wednesday (“To consider the societal benefits of biotechnology”) and the House Ag Subcommittee on General Farm Commodities and Risk Management will hold a hearing on Thursday (“Implementing the Agricultural Act of 2014: Commodity Policy and Crop Insurance”). Meanwhile, Lee Romney reported in Saturday’s Los Angeles Times that, “The Berkeley City Council on Tuesday evening is scheduled to vote on whether to put a tax of 1 cent per ounce on soda and other sugar-sweetened beverages before voters on the November ballot. And University of Illinois agricultural economist Paul E. Peterson indicated last week at the farmdoc daily blog (“Peregrine Financial Group: Two Years and Counting”) that, “July 10 marks the two-year anniversary of the Peregrine Financial Group/PFG Best brokerage firm bankruptcy. While PFG did not attract nearly as much attention as the MF Global collapse, it contains some important lessons for readers directly or indirectly involved in the futures/options markets. Kristina Peterson reported in today’s Wall Street Journal that, “Rep. Collin Peterson plays in a rock band named the Second Amendments. His staff includes a former GOP state legislator. He voted against the Affordable Care Act, and he worked with House Speaker John Boehner (R., Ohio) to hash out part of this year’s farm bill. “For more than two decades, Mr. Peterson’s conservative bent and focus on agricultural policy has helped him maintain his hold on the western Minnesota district he flies himself around in a Beechcraft Bonanza single-engine plane. But as one of just seven Democrats running for re-election in districts lost by President Barack Obama in 2012, he faces a new level of scrutiny this election cycle as he seeks his 13th term in the House. “Backers of Mr. Peterson cite his opposition to the health law and his help in passing a five-year farm bill this year—a significant qualification in a state where the party is officially called the Democratic-Farmer-Labor Party and radio stations break to give updates on commodity prices,” the article said.